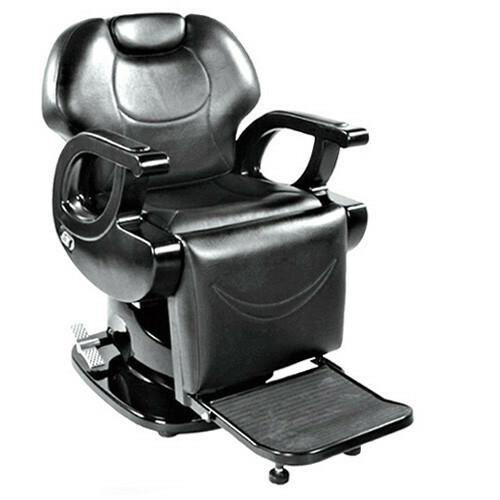 The Reynolds Barber Chair features an electric base and reclining mechanism. Two motors separate movement into different parts: one moving the entire unit up or down via the base, other reclining the backrest smoothly. The Reynold’s uniquely designed leg rest changes automatically to any motor adjustment for assured customer comfort. The barber chair’s headrest can adjust or be removed to your desire. Headrest can extend 7”, backrest can recline up to 70 degrees. Locking footbrake levers ensure safety, and are located on either chair side near the base. Reclining switch for backrest is conveniently placed on the right-hand side of the chair.